To the east of Eugene, Fall Creek National Recreation Area is one of the nicest summer getaways near the Eugene area. Fall Creek Reservoir was originally built for flooding control but this man-made pool is rife with water activities in the summer. You are free to swim all day but if it’s too crowded, you can find a free hole along the 13.7-mile-long Fall Creek National Recreation Trail. 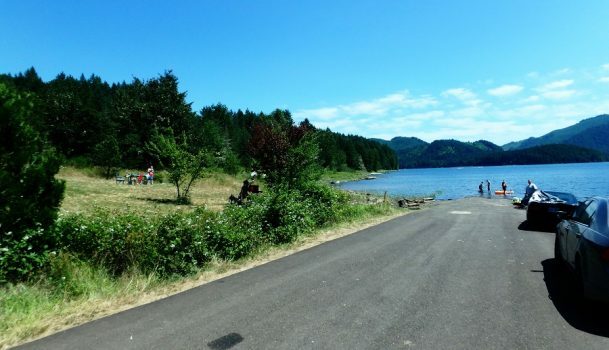 Fall Creek Lake is surrounded by day-use parks and campgrounds managed by the State of Oregon. North Shore is one of the 5 day-use sites that features swimming area, picnicking, and boating. Located near Fall Creek Dam, the North Shore Day Use Site has both a high and low-water ramps. Standing water of the Fall Creek Lake is usually warmer than in the creek. 84 miles southeast of Salem. Bear left after passing Winberry Creek Road and follow 1.9 miles to North Shore Park on the right.